OK, so I know there are more exciting bags out there. But I haven't had a new bag in quite a while, so I am beside myself. I bought some great kitchen towels from IKEA over a year ago and placed them in my stash thinking they would make cute bags. When I was busying away with making stuff for the reunion, I decided to pull one out and make a bag as well. Um, I kinda fell in love with it and decided not to part with it. Fortunately, this thing was crazy easy to make so I made another one for the reunion and I did part with it. And guess what? I took enough pictures of the other one to make a tutorial, so I am working on that. Anyone interested in the tutorial? It took under an hour to make and it only requires the most basic of sewing skills. Really. All of you lurkers, now is your chance to make your voice heard (while boosting my confidence and reminding me that people actually read my ramblings). 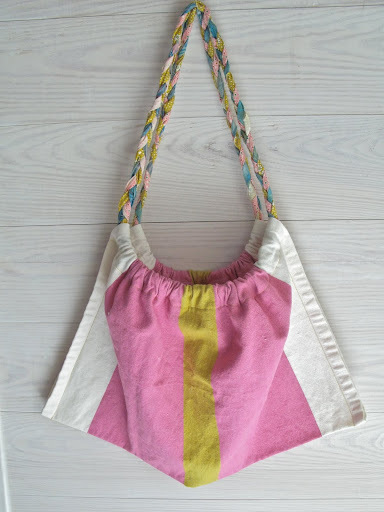 I know... a kitchen towel bag tutorial may not make you want to shout with joy, but the end result is quickly and easily obtained (bonus points for that). And did I mention it is super cute? What a great idea using the towels and I like the braid. yes please! It'll be like you're there guiding me through our evening fun! I also have 2 kitchen towels I love but they dont 'dry' much, so lets make a bag!!! PS I read most of your blogs, you write so well and your photos are beautiful! I love it! 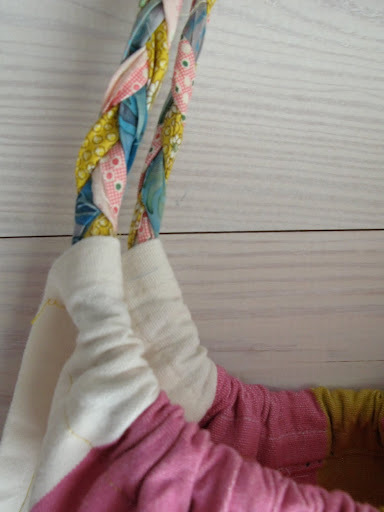 What a great idea to use kitchen towels and the braid is super cute. And yes, do a tutorial! I love the bag, I really do! But I am about to die with anticipation. I want to see the dresser project! I love stuff like that, and I just cant wait to see how it turned out. I do! I do!! I'd love to learn how! Miss you friend! Very cute bag and using towels takes out the cutting time which can be a real pain! I love the braided handle. The braided strap is my favorite part! Yes, by all means... a tutorial! I have no towels to refashion, but plenty of fabric. very very cute Amy! I love that you just made it up with no pattern, very creative! I love that bag and have to say that the handle is my favorite part! !